There aren’t too many modern cars that have engines of mammoth proportions—think 7.0-liters or higher— and those that do are stupidly fast and astronomically expensive. Notable examples include the 8.0-liter Bugatti Chiron, 7.0-liter Aston Martin Vulcan, and absurd 8.4-liter Dodge Viper. So in a sense, large engines and high price tags are still correlated to this day, but not to the same extent that they were in 1978. At that point in history, the Lincoln Continental had a 7.5-liter V8 that produced a paltry 224 horsepower. That kind of horsepower-per-liter ratio sounds pathetic to us nowadays, but in 1978, it was the very definition of luxury. That’s not the case anymore. 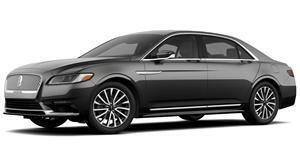 The 2017 Lincoln Continental comes with Matthew McConaughey’s seal of approval as well as three engine options, a 3.7-liter V6, a twin-turbo 2.7-liter V6, and a twin-turbo 3.0-liter V6. They make 305 horsepower, 335 horsepower, and 400 horsepower respectively, a vast improvement over the ancient power plant from 1978. But how does that look like in real life? The Fast Lane Car was curious enough to put the two cars together for a drag race. The results are obvious from the get-go and if they weren’t, well, Ford would have quite a few problems on its hands. However, the old Continental has one trick up its sleeve: gobs of torque output that's on par with the new Continental. Can it redeem itself using torque alone even though it only has a three speed automatic transmission? See for yourself but don't get your hopes up too high.